Ladypants is not feeling well so I made her some soup. Preheat soup pot, add fat chunks to melt. Once a layer of fat covers bottom of pan, brown chicken parts. Add onions, carrots, ginger and garlic. 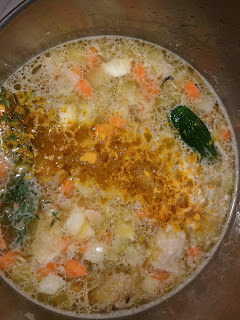 When onions have softened, add tumeric, bouquet of thyme, jalapeno, bay leaves beer and water. Bring to simmer and add rice. Simmer for 35 minutes, add red pepper and cauliflour. Simmer for 10 more minutes while discarding chicken skin/fat/jalapeno and removing meat from the bones. Adjust seasoning, add cilantro, serve hot, eat and enjoy. Chopping through the nubs of the drumstick allows marrow flavour to escape into the soup, creating a more flavourful broth. I made this kind of soup because ginger, garlic, chicken and tumeric are all health promoting ingredients that work very well together. Thanks for looking after Ladypants! Yeah, thanks for looking after me! It was delicious soup.